Reading and share top 32 famous quotes and sayings about Battlefields by famous authors and people. 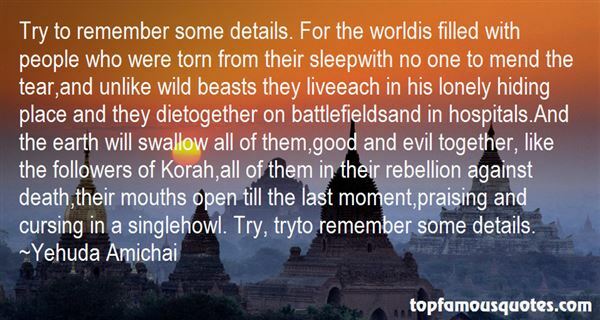 Browse top 32 famous quotes and sayings about Battlefields by most favorite authors. 1. "PhilosophyI studied philosophy for four years. But I'd trade everything I learned for this passage... quoted in the Britannica:'But we were born of risen apes, not fallen angels, and the apes were armed killers besides. And so what shall we wonder at? Our murders and massacres and missiles, and our irreconcilable regiments? Or our treaties whatever they may be worth; our symphonies however seldom they may be played; our peaceful acres, however frequently they may be converted into battlefields; our dreams however rarely they may be accomplished. The miracle of man is not how far he has sunk but how magnificently he has risen. We are known among the stars by our poems, not our corpses.'Amen." 2. "Acts of bravery don't always take place on battlefields. They can take place in your heart, when you have the courage to honor your character, your intellect, your inclinations, and yes, your soul by listening to its clean, clear voice of direction instead of following the muddied messages of a timid world." 3. "The battlefields of life were first meadows and gardens. We made them into battlefields, and by the same power, we must release the dark spell, so they are meadows and gardens once again." 4. "The offspring of nationalist thinking too often expresses itself in exclusionary and passively-violent legal policies, and then sadly, through militarism, which becomes manifest on the endless blood-soaked borders and battlefields of humanity's great failure as a humane species." 5. "Most economists are accustomed to treating companies as idyllic places where everyone is devoted to a common goal: making as much money as possible. In the real world, that's not how things work at all. Companies aren't big happy families where everyone plays together nicely. Rather, most workplaces are made up of fiefdoms where executives compete for power and credit, often in hidden skirmishes that make their own performances appear superior and their rivals' seem worse. Divisions compete for resources and sabotage each other to steal glory. Bosses pit their subordinates against one another so that no one can mount a coup.Companies aren't families. They're battlefields in a civil war.Yet despite this capacity for internecine warfare, most companies roll along relatively peacefully, year after year, because they have routines – habits – that create truces that allow everyone to set aside their rivalries long enough to get a day's work done." 6. "Companies aren't families. They're battlefields in a civil war." 7. "One dictum I had learned on the battlefields of France in a far distant war: You cannot save the world, but you might save the man in front of you, if you work fast enough." 8. 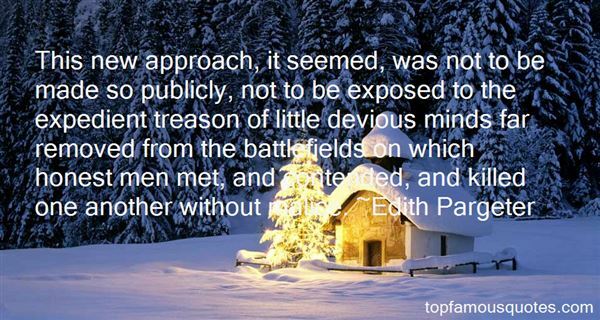 "This new approach, it seemed, was not to be made so publicly, not to be exposed to the expedient treason of little devious minds far removed from the battlefields on which honest men met, and contended, and killed one another without malice." 9. "The others moved in like a wake of vultures, ready to devour their prey. she had seen it on television once. 'Scavengers,' Tatinek called them. They swoop in and feed off the carcasses of animals that are too weak to escape - lots of them on battlefields. This looked the same, only the victim wasn't there, just his writing, his typewriter, and bits of dark paper." 10. "To his surprise he felt a moment of regret, of sadness that his quest for his mother and father would soon be over. As long as he searched for them he was prepared to be hungry and ill, but now that the search had ended he felt saddened by the memory of all he had been through, and of how much he had changed. He was closer now to the ruined battlefields and this fly-infested truck, to the nine sweet potatoes in the sack below the driver's seat, even in a sense to the detention center, than he would ever be again to his house in Amherst Avenue." 11. "Soldiers who return from foreign battlefields with a syndrome that survivors of the Great War called the thousand-yard stare." 12. "So this book is a sidewalk strewn with junk, trash which I throw over my shoulders as I travel in time back to November eleventh, nineteen hundred and twenty-two.I will come to a time in my backwards trip when November eleventh, accidentally my birthday, was a sacred day called Armistice Day. When I was a boy, and when Dwayne Hoover was a boy, all the people of all the nations which had fought in the First World War were silent during the eleventh minute of the eleventh hour of Armistice Day, which was the eleventh day of the eleventh month.It was during that minute in nineteen hundred and eighteen, that millions uponmillions of human beings stopped butchering one another. I have talked to old men who were on battlefields during that minute. They have told me in one way or another that the sudden silence was the Voice of God. So we still have among us some men who can remember when God spoke clearly to mankind." 13. "You could spend hours following the trail of a single dispute, through smoking battlefields of interlinked comments threads and screen shots and blogs where the message "this post has been deleted by its author" stands like a tombstone over the grave of the one witness who can tell you what really happened. I know, because I've wandered extensively over this blasted heath in the past couple of weeks." 14. "This nation was founded by rebels and revolutionaries, and its flags were carried across the battlefields by people who were very, very against the status quo and who questioned and criticized." 15. "We have much to be judged on when he comes, slums and battlefields and insane asylums, but these are the symptoms of our illness and the result of our failures in love." 16. "Watching the children, he noticed two things especially. A girl of about five, and her sister, who was no more than three, wanted to drink from the pebbled concrete fountain at the playground's edge, but it was too high for either of them, so the five-year-old…jumped up and, resting her stomach on the edge and grasping the sides, began to drink. But she was neither strong enough nor oblivious enough of the pain to hand on, and she began to slip off backward. At this, the three-year-old…advanced to her sister and, also grasping the edge of the fountain, placed her forehead against her sister's behind, straining to hold her in place, eyes closed, body trembling, curls spilling from her cap. Her sister drank for a long time, held in position by an act as fine as Harry had ever seen on the battlefields of Europe." Pg 32"
17. "This way of settling differences is not just. This business of burning human beings with napalm, of filling our nation's homes with orphans and widows, of injecting poisonous drugs of hate into the veins of peoples normally humane, of sending men home from dark and bloody battlefields physically handicapped and psychologically deranged, cannot be reconciled with wisdom, justice, and love." 18. "Now that it's officially summer, here's my advice to parents who want to continue teaching their kids during the next two months and learn something themselves: visit Civil War battlefields." 19. "Wars don't happen on battlefields; they go on happening in people's hearts for generations and generations, and the ecological damage is unfathomably complex and dire." 20. "No quality imparts apparent strength to its possessors more effectively than faith. From hospital beds to battlefields, it is the iron that strengthens a man to confront his destiny." 21. "Some of the worst violence in the world today between estranged religious and ethnic groups happens not on the battlefields. It happens smack in the middle of living rooms and between people who share a lot, who have a lot in common." 22. "I have a burden on my soul. During my long life, I did not make anyone happy, neither my friends, nor my family, nor even myself. I have done many evil things...I was the cause of the beginning of three big wars. About 800,000 people were killed because of me on the battlefields., and their mothers, brothers, and widows cried for them. And now this stands between me and God." 23. "In the 360-degree battlefields of Iraq and Afghanistan, women have served honorably and fought valiantly. Yet there is a key difference between being in harm's way and reacting to enemy contact, and being in a direct combat operations role day in and day out. They are different scenarios that require different standards." 24. "However, as our brave men and women continue to return from the battlefields of the War on Terror, Congress must respond by enacting policies that meet the evolving needs of the veterans community." 25. "But we were born of risen apes, not fallen angels, and the apes were armed killers besides. And so what shall we wonder at? Our murders and massacres and missiles, and our irreconcilable regiments? Or our treaties whatever they may be worth; our symphonies however seldom they may be played; our peaceful acres, however frequently they may be converted into battlefields; our dreams however rarely they may be accomplished. The miracle of man is not how far he has sunk but how magnificently he has risen. We are known among the stars by our poems, not our corpses." 26. "Yes...how else could Demandred explain the skill of the enemy general? Only a man with the experience of an ancient was so masterly at the dance of battlefields. At their core, many battle tactics were simple. Avoid being flanked, meet heavy force with pikes, infantry with a well-trained line, channelers with other channelers. And yet, the finesse of it...the little details...these took centuries to master. No man from this Age had lived long enough to learn the details with such care." 27. "She's special. We used to unleash her on ancient battlefields just to see soldiers chop their best friends into pieces before falling on their own swords. (Deimos)"
28. "History pays no heed to the unspectacular citizen who worked hard all day and walked at night to a humble home with dust on his tunic and his flat cap. But in the end the builders have had the better of it. The miracles they accomplished in stone are still standing and still beautiful, even with the disintegration of so many centuries on them, but the battlefields where great warriors died are so encroached upon by modern villas and so befouled by the rotting remains of motorcars and the staves of oil barrels that they do not always repay a visit." 29. 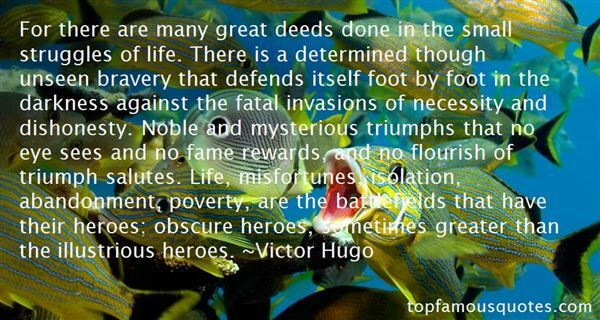 "For there are many great deeds done in the small struggles of life. There is a determined though unseen bravery that defends itself foot by foot in the darkness against the fatal invasions of necessity and dishonesty. Noble and mysterious triumphs that no eye sees and no fame rewards, and no flourish of triumph salutes. Life, misfortunes, isolation, abandonment, poverty, are the battlefields that have their heroes; obscure heroes, sometimes greater than the illustrious heroes." 30. "All this occupied his thoughts when he revisited the places of his war. Tramping over soil fed by the blood of men he had led and whose faces now stirred in his memory, it was his wife's response that came - as if in compensation for too little said before - when he wondered why his wandering had led him back to these old battlefields: in his sixty-ninth year he was establishing his survivor's status." 31. "Woe betide the leaders now perched on their dizzy pinnacles of triumph if they cast away at the conference table what the soldiers had won on a hundred bloodsoaked battlefields." 32. "Try to remember some details. For the worldis filled with people who were torn from their sleepwith no one to mend the tear,and unlike wild beasts they liveeach in his lonely hiding place and they dietogether on battlefieldsand in hospitals.And the earth will swallow all of them,good and evil together, like the followers of Korah,all of them in their rebellion against death,their mouths open till the last moment,praising and cursing in a singlehowl. Try, tryto remember some details." I've learned that Knowledge can take you to places were no money can take you"." Author: Abdul Bari Abdul Ghafoor.